A common point of confusion for players was whether an adjacent Totem’s effects would take place at her location or the Totem’s location. 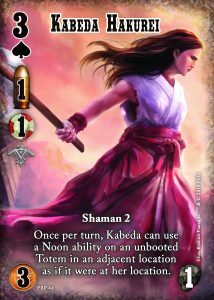 Although we already ruled that it would affect her location, we hope this errata makes it even clearer, and we’ll be debuting the new text on the full-bleed promo of Kabeda we’re issuing as part of the upcoming Hunting Grounds Series. Happy hunting, y’all!